How many times have you been out and seen a crazy spectacle that you wanted to discreetly take a picture of? There have been so many instances where I have tried to take a picture of something ridiculous just to be threatened or chased away. Now we have Gotcha, an app that disguises the act of taking photos and saves you from the drama of what follows. Just make sure that your phone is on silent because the camera clicking sound effects do still go off with this app. 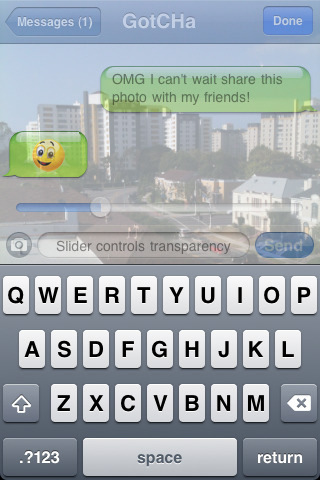 Gotcha provides a phantom screen that looks as if you are texting. The keyboard is up along with a message that reads “Hey how’s it going? What are you up to today?” and a response of a smiley face. In the upper left corner is the messages button that shows you have a message and the upper right has the done button. The app provides a completely thorough messaging screen. In the typing box is a reminder that the slider in the middle of the screen controls transparency. What this means is that the screen can become completely transparent or opaque regarding the view of the picture you are about to take. If you are confident that there is no one peering over your shoulder, you can make the screen more transparent so you can see the image you are about to take but if you know there is someone behind you lurking then you can leave the slider on the opposite end of the spectrum so that all you see is the message. All it takes to capture the picture is to touch the screen anywhere. Once the picture has taken, the smiley face in the message winks at you. All of the pictures you take with this app go directly into your camera roll album on your iPhone and this app is only compatible with iPhone 4.0 software. The idea is undeniably creative and for $0.99 anyone can afford to have this invaluable app. I would say the only complaint I have—if you can call it that—is that the area that they give to take the picture is way too big. When I use this app I end up taking a bunch of pictures I have to go through and delete because any slip of the finger leaves me with twelve blurry pictures. AppSafari review of GotCHa photo edition was written by Vanessa Paszterko on July 2nd, 2010 and categorized under App Store, Fun, Photos, Utilities. Page viewed 6798 times, 2 so far today. Need help on using these apps? Please read the Help Page. This app is fun – looking forward to the update. Great recommendation…what a fun app!!! Can’t beat it for .99.
nice app. comes in handy.